Facebook is often explained away as a hangout for idlers. Not quite so. It pulls off, sometimes in great vigour, discussions from different groups not because they are isolated from the traditional media, but because it engages people up close. If you have already stumbled upon a Facebook group, Unite for Yunus, you have probably noticed how it churns out threads of discussions on hot-button issues: microcredit and its guru, Muhammad Yunus. It is a success story, if you like, of Facebookers who have created a group on March 3 to defend a man against all rants and slurs swirling in a section of newspapers and blogs. It is a fight, probably never to win, but, surely, to cut through misconceptions about Yunus and his organisation. It came at a time when he is fighting a legal battle for a dignified, smooth transition from the Nobel winning organisation he founded three decades ago. Some of the Facebookers said their task is not only to defend the Nobel laureate but also to feed people with facts and informed opinions. They answer questions over whether microcredit can really lift people out of extreme poverty, whether interest rates are too high, whether Yunus is larger as a creator than his creation, Grameen Bank that is. One debate feeds into another and creates a new thread of thoughts, pulling hundreds of people into a swoon on a scale never seen before. M Sanaullah, also known as Lablu among his friends and colleagues, is one such Facebooker. Despite his busy days as the head of news and programmes for ABC Radio, he sets aside some time every day to post his thoughts and related articles on Facebook keeping Yunus in the spotlight. In Bangladesh, Facebook has largely been dominated by the youth, but his friends say the presence of a man his age has added a new dimension to the unfolding discussion. 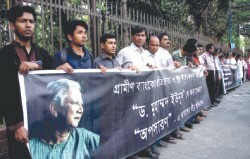 On March 18, a quiet Friday, Sanaullah drove to Shahbagh to meet his Facebook friends who formed a human chain in their first street demonstration to defend Yunus in his troubled times. As the line of Yunus adherents was stretching far out with more participants, Humaira Chowdhury, another Facebooker, was there with copies of a press release in hand. With the day wearing on, more people joined hands with the human chain and the online group made its presence felt in the offline world as well. When the Facebook group was created, Humaira did not expect the number of users would swell past the 5,000 mark in a space of a little more than two weeks. “It's amazing to see how so many people are signing up in such a short time,” she said. After the news of the removal of Yunus was out, Nabeel Mohammad, who initially created the Facebook account, was looking for a way to share his thoughts with others. “I wanted to talk to someone. I wanted to ask someone if they felt the same way I did. But when I looked around I only saw Americans. I wanted a Bangladeshi to talk to. I was getting really restless to reach out to my native people for a justified answer to all my questions,” said Nabeel, now living in the US. Not everyone is a strong defender of Yunus, though. Here lies the big challenge for the members of the Facebook group. They spend hours to counter the posts that criticise microcredit and its pioneer. “There are a lot of misconceptions out there about microcredit and Grameen Bank,” Humaira said. She feels obligated to dispel the misconceptions by driving more people into discussions and responding to posts from others that stream in by the hour. It is also the beauty of the social media: sometimes, a hub of lies and falsifications and, at the same time, a platform that allows users to share facts with others and put things in right perspective just as quickly.